Own Foyles War 1939-1941 DVD from Deff, DVD, Blu-Ray & 4K Video Specialists - Free UK Delivery..
Own Foyles War 1942-1945 DVD from Deff, DVD, Blu-Ray & 4K Video Specialists - Free UK Delivery..
Michael Kitchen stars as the thoughtful and enigmatic Detective Chief Superintendent Foyle. England is in the grip of the Second World War and Foyle, anxious to join the war effort, has repeatedly had his applications turned down. He returns to the South Coast sidelined and frustrated, but it soon becomes apparent that his detective skills are vitally needed on the Home Front. 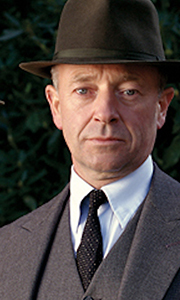 This boxed set contains: The German Woman' The White Feather..
Own Foyles War Series 1 to 8 Complete Collection DVD from Deff, DVD, Blu-Ray & 4K Video Specialists - Free UK Delivery..
Michael Kitchen stars as the thoughtful and enigmatic Detective Chief Superintendent Foyle. England is in the grip of the Second World War and Foyle, anxious to join the war effort, has repeatedly had his applications turned down. He returns to the South Coast sidelined and frustrated, but it soon becomes apparent that his detective skills are vitally needed on the home front. This boxed set contains: Fifty Ships, Among The Few, War Gam..
Michael Kitchen stars as the thoughtful and enigmatic Chief Superintendent Foyle. England is in the grip of the Second World War, and Foyle, anxious to join the war effort, has repeatedly had his applications turned down. He returns to the South Coast sidelined and frustrated, but it soon becomes apparent that his detective skills are vitally needed on the Home Front. This boxed set contains: The French Drop, Enemy Fire, They Fought In ..
Michael Kitchen stars as the thoughtful and enigmatic Detective Chief Superintendent Foyle. England is in the grip of the Second World War and Foyle, anxious to join the war effort, has repeatedly had his applications turned down. He returns to the South Coast sidelined and frustrated, but it soon becomes apparent that his detective skills are vitally needed on the Home Front. This boxed set contains: Invasion, Bad Blood, Bleak Midwinte..
Michael Kitchen stars as the thoughtful and enigmatic Detective Chief Superitendent Foyle. The war is over in Britain and Foyle, among many others, must find his way in this new world. his hopes of retirement are dashed due to a shortage of senior men and he finds himself investigating international conspiracy, betrayal and military racism. This boxed set contains: The Russian House, Killing Time, The Hide.Special Features Cast Biogra..
Michael Kitchen returns to the screen as Detective Chief Superintendent Foyle, a man of scrupulous integrity who has survived the First World War, solved crime wherever it led him during the Second, and now finds himself called into duty at the risk of a possible Third. The Second World War may be over - but a new one is beginning, less explosive but no less deadly - a Cold War. Foyle finds himself drawn into complex webs of security an..
Michael Kitchen returns to the screen as Detective Chief Superintendent Foyle, a man of scrupulous integrity who, having survived the First World War, solved crime in Hastings during the Second and now finds himself working with MI5 to keep the country safe, while bringing justice to those who deserve it. This series includes three powerful new films: High Castle: Foyle is drawn into the world of corrupt Nazi businessmen when a Universi..
Michael Kitchen stars as the thoughtful and enigmatic Detective Chief Superintendent Foyle. England Is In the grip Of the Second World War And Foyle, anxious to join the war effort, has repeatedly had his applications turned down. He returns to the South Coast sidelined and frustrated, but it soon becomes apparent that his detective skills are vitally needed on the Home Front. This boxed set contains: Plan Of Attack, Broken Souls, All C..